Members of the RHBA learned about the services and history of ESL Federal Credit Union at the October meeting at D’Mangu restaurant. Arline Santiago, senior vice president and general counsel for ESL, was joined by Keith Cleary, vice president and director of business banking, and Malik Evans, business growth program manager. Santiago talked about how ESL’s roots go back to George Eastman, who created Eastman Savings and Loan Association in 1920 to help Eastman Kodak employees get mortgages and succeed in their personal lives. In 1966, that entity became ESL Federal Credit Union. Today ESL has 20 branches in the region and more than 700 employees. ESL has $5.9 billion in assets. The company’s headquarters moved to downtown Rochester six years ago. Cleary talked about the business banking that ESL has been doing since 2010. ESL is one of the biggest local institutions bank wise. As business growth program manager, Evans works to help businesses get access to capital and develop business acumen. 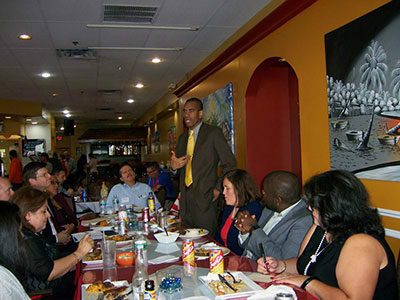 ESL partners with organizations such as SCORE, PathStone and the Center for Urban Entrepreneurship. To view the photo gallery from the event, click here.